Did I ever tell you about rutabaga hell week? For a couple weeks in a row, I got a total of about 10 large rutabagas in my Abundant Harvest box. I wasn't sure that I was going to get along very well with rutabagas. I am not much of a turnip gal, and the rutabagas have the coloring of over-grown turnips, which made me pretty sure that they were going to tasted similar. The first week I had rutabagas, I very carefully put them at the bottom of the crisper drawer and let them serve a prison sentence. The second week when I got more rutabagas, I realized that they weren't going anywhere unless I was willing to set them free. Mind you, the previous stash were happy and edible as you please, still living out their term in the refrigerator penitentiary. So now my inmate population had doubled, but my desire to reform them had not. So, I decided to shred, dice, shop, and puree them into just about anything I could. They made a guest appearance diced into a broccoli and cauliflower salad, and they were shredded into cole slaw. They got mashed with some potatoes (and those potatoes themselves made two appearances on our table, once alone and once topping a Shepherd's Pie). They were added to a pot of stew. I was trying anything I could do to get myself and my family to eat the rutabagas without having to actually taste the rutabagas. One day, as we sat down to dinner, I was giggling silently to myself, as I noticed that there were three dishes on the table... and every single one of them had some rutabaga hidden in it! Finally, I relented, stopped trying to hide the blessed things, and took the last two rutabagas and peeled and cut them and roasted them with a chicken. Rutabaga as rutabaga? It was a novel idea. And it turns out, I like them! They're yummy! Rutabagas are sweet and mild flavored. They take on their seasoning well... I have now roasted them with rosemary, thyme, and plain old salt and pepper, and I like them all. 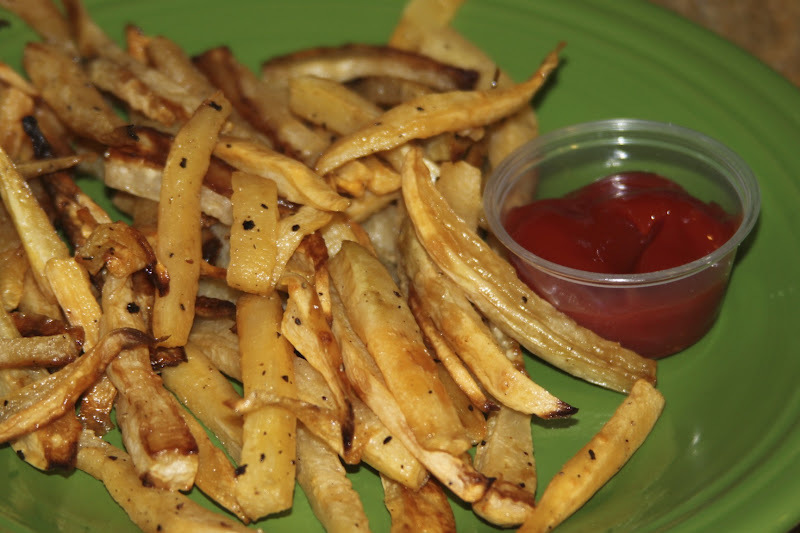 I decided to go ahead and make some rutabaga "fries." 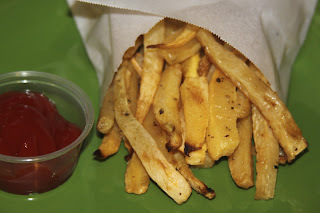 I figured that my kids would be mush more likely to willingly try "fries" than they would be to try "roast rutabaga." 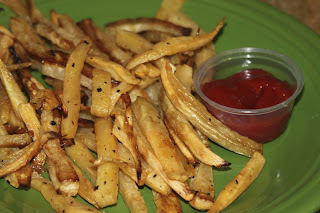 Whether my logic was true or not, I am glad to report that all three kids cleaned their plates, and one even asked for seconds... and I did admit to them that they were eating rutabaga. Score one for the veggies! The idea is the same as roasting any root vegetable... get the oven nice and hot, cut the rutabaga up (in this case, into sticks), and coat it with oil. I then sprinkled them with salt and pepper and laid them out on a baking sheet in a single layer. I let the rutabaga roast for about 20 minutes, turned it all over, and then roasted it for another 20 minutes or so. 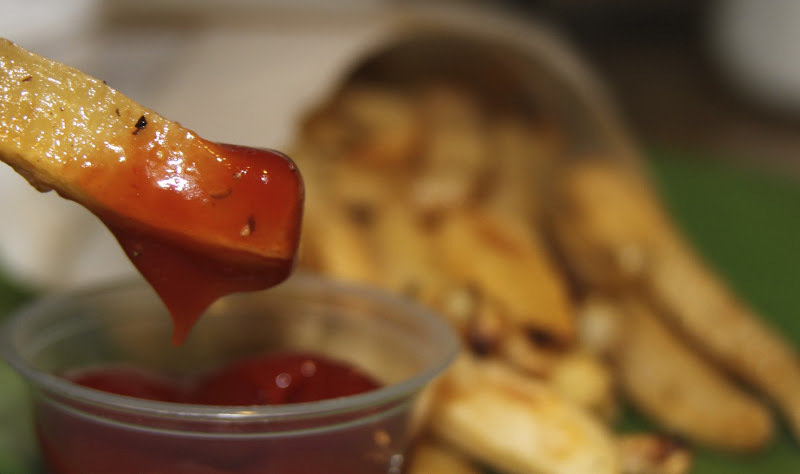 Let it get nicely browned, then let it drain any excess oil onto a paper towel, and enjoy!